The 4th of July is one of my favorite holidays. Who doesn’t love fireworks and sparklers? I think I love it so much because it’s in the summer and that means we get to wear shorts and flip-flops and grill our dinner. I’m a sucker for warm weather so I love everything associated with that season. I especially love finding festive treats to serve at our get-togethers that don’t involve lots of sugary sweets. That’s a hard thing to do, since most of the things I see floating around are cookies and candy. 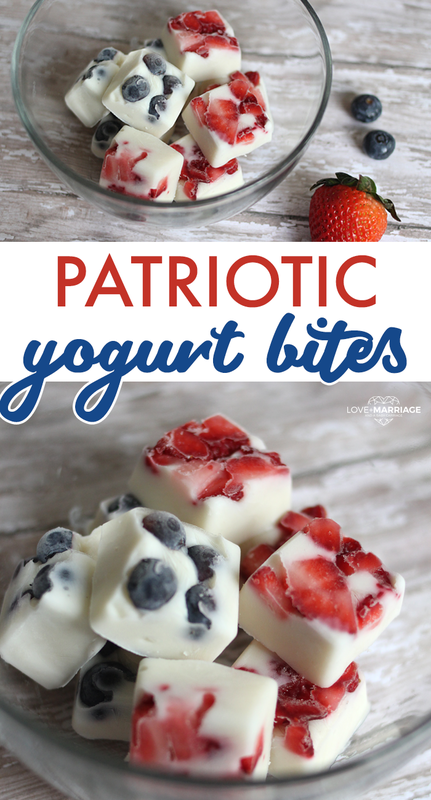 I decided to make a new treat with things I know my kids will eat but that will also look fun for the 4th of July. 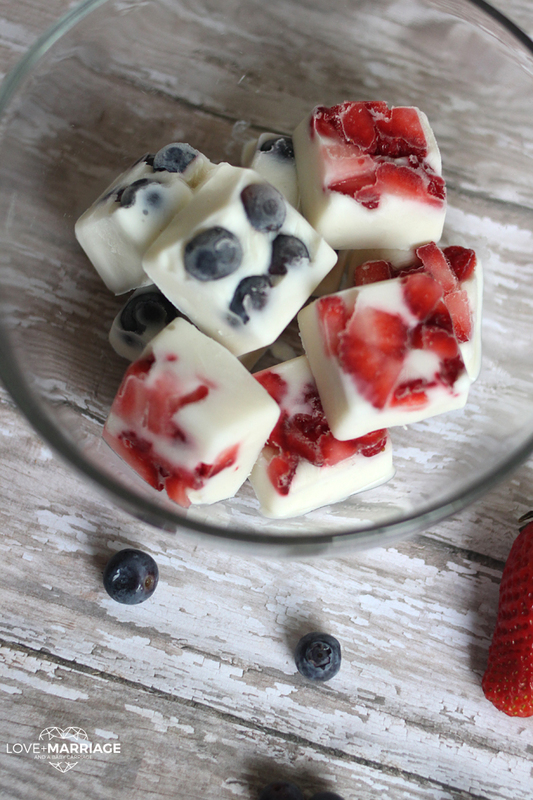 These red and blue yogurt bites turned out great and my kids love them. The recipe is pretty simple: dice your strawberries and halve your blueberries. 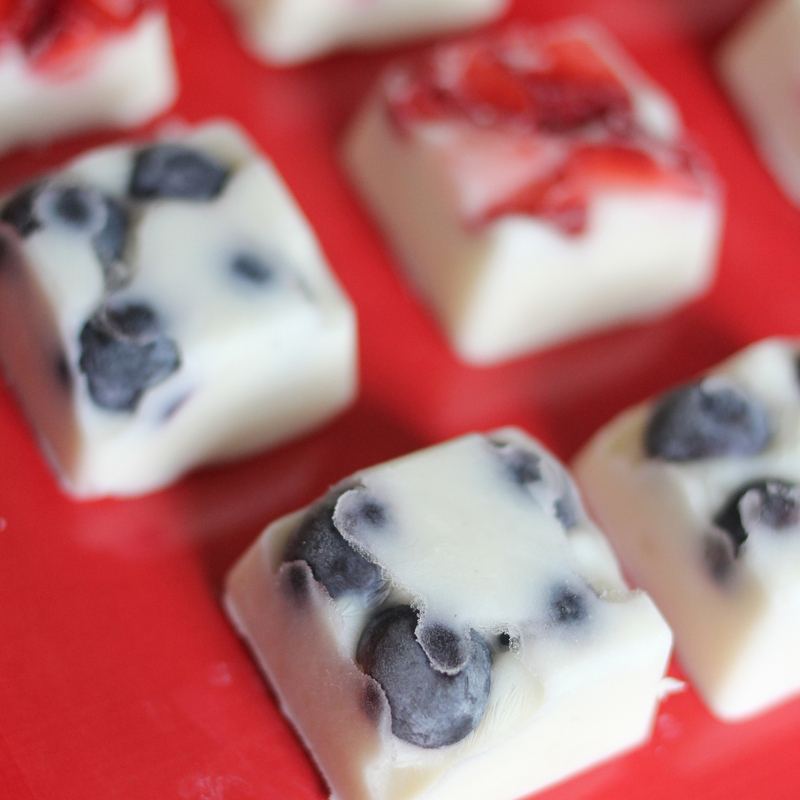 Place them in a silicone mold and cover with yogurt. Make sure to put the blueberries round side down. As for the strawberries, dice them in very tiny pieces. Leave them in the freezer for about 2 hours and they are ready to eat! You can place them in a bowl sitting on ice so they won’t melt, but they won’t last for long sitting outside of the fridge and freezer, so keep that in mind. To strengthen and shield your teeth against sugar acid attack from all the treats you might be eating, grab some Aquafresh® Multi-Action Whitening toothpaste. It contains fluoride that provides Sugar Acid Protection, which is so important to help prevent cavities*. I love strawberries with whipped cream. We love my healthy Raspberry Sorbet. I like a fresh fruit salad. I like a berry and yogurt parfait. My favorite summer time treat would have to be frozen yogurt. I like cookies and cream and cookie dough frozen yogurt or plain vanilla. My favorite Summer treat is watermelon and strawberry Shortcake. I love fresh fruit salad and cut up seedless watermelon. I love fresh fruit all year round but it seems to taste better in the summer! I like chopping up various fruits and just adding it to water for drinking, usually in a large tea jar. Homemade popsicles are fun too, my kids go through them like crazy! I have never really incorporate healthy habits when it comes to fourth of July, but I will thinking about it for sure. I love making fruit salad in the summer for all our bbq’s! We like strawberries and whipped cream! My daughter likes to make strawberry and banana smoothies. I love fresh blueberry cobbler in the summer! My favorite healthy summer sweet treat is frozen banana and berries bites. kids love them. We love frozen banana bites for summertime. My favorite summer time sweet treat is ice cream. To me, there is nothing better than fresh peach sorbet or ice cream. I love frozen grapes. They are so delicious! I love to make a cool and refreshing fruit salad in the summer with watermelon, strawberries, blueberries and cantaloupe with whip cream! I am sooooo gonna make these! I can’t wait to try them. We usually have fruit popsickles for a healthy treat. We like to make fruit dip and fruit parfaits. My kids love to help me make, and eat, fruit kabobs. I love watermelon: in slices, grilled, chopped in a salad …. anyway you serve it I will be eating it! My favorite healthy treat is greek yogurt. I eat it every day and never get tired of it. I love a good all fruit/ice smoothie. No yogurt or dairy or anything heavy (although I love your idea!!). Just fruit and ice blended. SOOOO good! 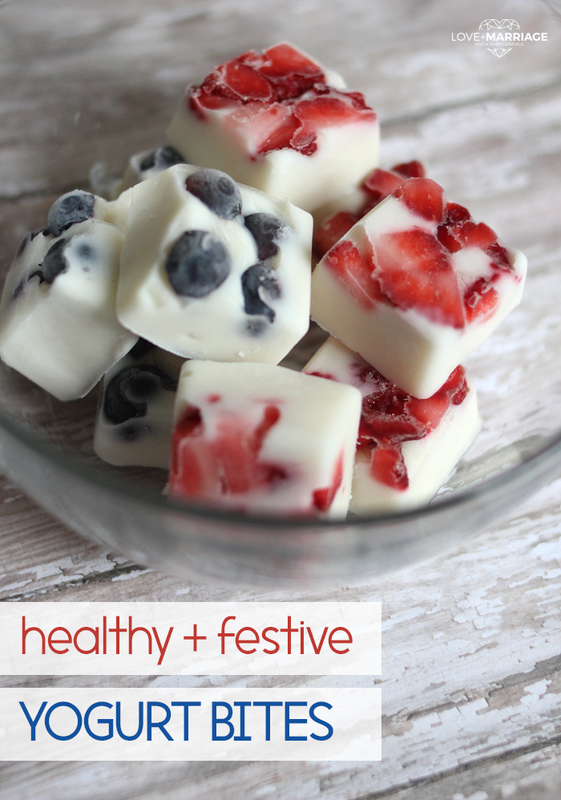 My favorite easy and healthy summertime sweet treat recipe would be a Berries and Parfait Popsicle. I like making kabobs out of strawberries, blueberries and pineapple. And I like frozen grapes anytime. Our favorite summertime sweet treat are popsicles! My favorite summertime healthy treats are fruit and vegetable kabobs. I love fresh strawberries, and stone fruit, especially peaches, plums and apricots. Frozen smoothie pops, with flavor options — fresh fruit and spinach with banana is current favorite. Great recipe! Healthy, pretty and great for the Fourth of July, or any time.